Music Lessons Pensacola - Guitar,Drums,Voice,Piano - Call Now! When it comes to Music Lessons Pensacola, Ron Kaye’s Music Instruction is far ahead of all others. We teach Drum, Guitar, Bass, and Piano, or Voice lessons. In addition, we can teach you how to play the Banjo, Mandolin, Violin, or Ukulele, and more. We teach real music, and many of our students go on to become multi-instrumentalists. Learn to understand music and open up another wonderful world. Ron Kaye’s Music Instruction the Right Choice for Music Lessons! Reasonable Rates : $25/Half-Hour & $35/Hour with a $20 Registration Fee. We, also, highly recommend you view the following pages to find great lessons in Dobro, Band, and even, Music Theory! We are Pensacola’s First Cutting Edge Music Studio. Our Music Lessons Pensacola at Ron Kaye’s Music Instruction organized the “First Ever Northwest Florida Drum Set Solo Contest” The contest brought in competitors as far away as New York City. We were, also, the first studio to bring the “World’s Fastest Drummer” (WFD) Competition to Pensacola. The WFD offered drummers a chance to compete on a World-Wide basis. We are the only local studio to have one of our drum students featured in a press release on the ProMark Drumsticks website. In addition, we are the only studio to have a student compete in the finals of the world-wide “Hit Like A Girl” Drum Contest for TWO consecutive years. Our studio was the first to bring student music performances to nursing homes, hospitals, and elderly care facilities. We, also, perform in local venues and outdoor Arts Festivals on a regular basis. We are the first local music studio to demonstrate the qualifications of our instructors by teaching thousands of students. Ron Kaye’s Music Instruction was the first local music lessons studio to offer a Band Program. Our Band Program has offered students the opportunity to perform with other students and instructors publicly. No other local studio pushes the envelope when it comes to excellence in music instruction. Music Lessons Pensacola taught by a local Family of Music Teachers! At Ron Kaye’s Music Instruction, all of our music teachers are members of the same musical family. Mr. and Mrs. Kaye have been happily married for 30yrs., and our studio exemplifies that loving relationship. Our daughter, Caroline plays the piano and guitar, while our son, Joshua, is also a multi-instrumentalist. Joshua currently has been teaching with Ron Kaye’s Music Instruction for 10yrs. All of our teachers are college educated, and two of our teachers have specific degrees in “Music Education” not merely music performance. Why is this important? Because Mrs. Kaye and Joshua are professionally licensed and trained as music educators with training and State Certification in teaching those who are challenged or have disabilities. In addition, all of the Kaye family teachers possess a decade or more of performance experience. Our music teachers are dedicated to learning about your personal musical goals and helping you to achieve them. Our students are kids from pre-school, to adults in their eighties. We are confident that we have the right teacher to meet your music lesson needs. Our teachers have warm personalities, they are patient, friendly, and dedicated to your success. You can visit the “Testimonial Page” to see what our music students and their families are saying about their Music Lessons Pensacola. Every year, aspiring music teachers start their own studio, and a year or two later it’s closed. Ron Kaye’s Music Instruction has a proven track record of offering quality music, guitar, voice, singing, piano, drum lessons, and more in Pensacola, Florida year round for almost two decades. Our full time mission is teaching music lessons. We are trusted by thousands of local individuals and their families to provide quality music lessons. Learn Real Music in a Home-like Atmosphere. Instead of waiting in a music store showroom, surrounded by hungry salespeople, our clients enjoy “no pressure” accommodations. You will find comfortable chairs, kids toys, books, and magazines for your enjoyment. If you desire we, also, provide bottled water or coffee services. We provide a comfortable atmosphere while you wait, or if you prefer you can sit in on the lesson anytime you like. Our studio is stocked with everything you need for your music lessons. We provide a great teacher, and all the additional equipment you will need. Our studios have amps, stereos, full drum kits, keyboards, pianos and more. One of the things that has really set us apart is our focus on providing lessons that are fresh, and engaging. There are so many teaching videos and apps out there, so we update our methods regularly. By doing so, our students never run the risk of being bored in their lessons. It’s a challenge to engage children or adults, but we integrate technology in a way that provides a cutting edge lesson experience. Music recitals in all types of interesting and diverse music venues along with our rock band showcase! Every parent just wants to know how their child is doing and if they are really progressing. The best way for a parent to understand their investment in lessons, is to have their child participate in a recital. Our recitals and concerts are voluntary, fun, and rewarding for everyone. We host a rock band showcase at least once a year, which gives our students the opportunity to play with a live rock band! 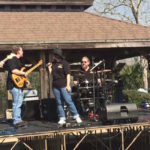 You or your child will love the opportunity to rock out on the big stage with a real rock band. You are encouraged to bring your family and friends to the show and share in the fun! Interestingly, we were the first in the area to offer such a program. Trophies, certificates and awards to celebrate achievement. We provide our students the opportunity to earn awards, certificates, medallions, and trophies for their musical achievement. These tokens of achievement provide a sense of accomplishment and pride for our students. The awards also bring a smile to the face of our parents as they see their child rewarded for their efforts. We, also, sell music instruments, books, and accessories. All of our students can purchase everything they need from our studio, whether it’s a instrument, books, strings, drumsticks or more, they can get it here and save money. We offer convenience and savings. We are a proud member of NAMM and support the promotion of music education worldwide. Music Lessons Pensacola are closer then you think. Due to its central location, our studio is convenient to all areas of Pensacola. Close to our schools, and the Navy Bases, You will find great shopping or dining and more within driving distance of our studio. Our location is convenient to all of Pensacola, and we have many students from Northwest, Florida, Santa Rosa County, and Southwest, Alabama. Our studio does not require semester minimums for lessons. Every student is registered on a month-to-month basis. If you are ready to start, you have nothing to lose. There are no long term contracts. Therefore, If you have any questions, please CALL us, see our F.A.Q. page, or our teacher profiles.